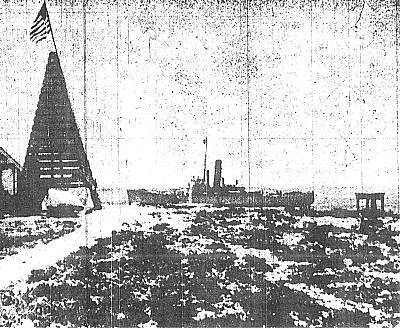 Landing was accomplished at a small break in the ringing reef on the northwest side, on the morning of March 26, 1935, just below a four-sided, triangular beacon. 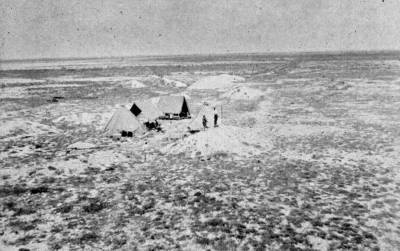 Three tents were set up in a depression between two mounds of flow-grade guano, behind the beach crest, about 200 feet southward from the beacon. This spot was chosen because fits protection from the wind and proximity to the landing place. Sailors from the Itasca brought our supplies and equipment ashore and piled it on the beach above the high water line. We carried it up to the beacon for safekeeping. Meyer and Bryan put their cots beneath the beacon. At about 2:15 A. M. there was a racket from there as they tried to catch Polynesian rats in an insect net. These rats are so small that they were called "mice" by the colonists. The last of our water and supplies were landed this morning and the sailors are looking over the island. Collins made a flag pole and attached it to the top of the beacon. At 1:25 P. M. the American flag was hoisted by Collins and Ahia while Aune, Toomey, and Graf stood at attention, and mem-bers of the official party watched the ceremony. Mr. Kline assisted Collins and Ahia in setting up the meteorological instruments. Collins fixed a box desk for reading and re-cording them. We lunched on fresh fish which Toomey had speared. Fish are plentiful around the island in shallow water. We pitched a fourth tent to use as a kitchen. Collins and the Hawaiian boys went to the wreck to get some 1umber. The Itasca left at about 2:30 P.M. and headed for Baker Island. Next morning (March 27) we rolled seven of the 15 drums of water up to the beacon. On another trip to the wreck to get lumber we found some money: German 10 pfennig dated 1875; Canadian 10 cent piece, 1902; Mexican 20 centavos, 1907; American Lincoln penny, 1910; a Hawaiian half dollar, 1883; and a Chile peso, 1893. We also found some dishes. March 28. Collins built a wooden table on which to draw maps of the island, showing where the airfield could be placed. Measurements by him and Ahia showed that Jarvis measures 1.90 miles N. E. to S. W. by 1 mile and 200 yards, wide. Aune took charge of the cooking. Graf cares for the medical supplies and keeps the log. Ahia and Toomey specialize in catching fish and spiny lobsters. All five worked as a team. A rain squall drifted across the island and a gallon of water was caught. Following the rain they planted five sprouted coconuts along the north edge of camp. During the days that followed, Collins plotted a good location for a landing field on the northeast side of the island about 1,240 by 1,000 yards. The distance between camp andthe east end of the island was measured, 2,400 yards. March 30. It was noted that for the second time since their arrival rain clouds were seen to approach the island from the NE and break up off shore. Parts of the storm seemed to go each way around the ends of the island. "So far we have noticed no mosquitoes or house flies." Sunday, March 31, brought us a fairly heavy rain with a SE wind varying from 18 to 24 miles per hour. Our tent fly blew down, but the storm brought us about 15 ga1lons of water. Ahia planted cabbage, radish, onion, celery, and lettuce seeds on the side of the guano ridge. Ahia's and Toomey's electric lights from batteries seem to draw more moths and other insects than the lantern does, at least they bother us more. Graf catches specimens for Bishop Museum. He noted that the most abundant insect in the tents was a "beetle-fly"; they are attracted by lights, get into bunks; sleep on the tent ceiling, and are a general nuisance. They do not bite, but their crawling in bed gives an uncomfortable feeling. [This has been identified as an Oedemerid beetle, Ananca bicolor; with slender, deep purplish-black elytra and a pale orange prothorax "collar." What we call "field mice" [small Polynesian rats] by the dozen crawl over the beds during the night and sometime in between the blankets. Our sleeping is done on portable camp cots, made of canvas over a collapsible frame. We use khaki wool blankets with no pillow or mattress. Each has sufficient bedding to suit his own idea of comfort. Some use two blankets under and two over, with one for a pillow. The nights are quite cool. Breakfast usually about 7:00; a mainstay, since we eat two meals a day. Toomey and Ahia like the water and supply us with marine food, both fish and lobsters. Each of us lends a hand with the cooking, water carrying and general camp duties. Ahia is greatly interested in plant and insect life and does some collecting. During any time of day one or two or more may be found here or there on the island, the shipwreck, fishing from the boat or what-not. At noon we may gather at the kitchen tent and eat a can of sauce or fruit together. No cooking is done at that time. The evening meal is eaten between 6:30 and 7:30. After that we talk, tell stories, play cards or checkers, practice on the mouth-organ, or sometimes catch insects around the light. We are building paths to improve the appearance of the camp. We have found farming in any form out of the question. The coconuts are making no progress. Planted garden seeds are eaten by the "mice." Everything dries up between showers and we can't pare fresh water. On April 11 there is the entry: We have all become interested in sporting events, and at about 9 o'clock we held a meet: shot-put, standing and running broad jump, high jump and ball throwing. Then we go swimming, or across to the shipwreck to fish. On April 13, Ahia noticed that the boat was missing. It had broken away, apparently as the result of an exceptionally high tide. We did not see it again. On April 18, while cooking breakfast the oil stove caught fire. Graf dragged it out of the tent and put a wet blanket over it; but the stove was damaged beyond use. Work began immediately on a fireplace a few feet southwest the kitchen tent. Breakfast was delayed, but not for long. April 19. Conditions around camp are getting better day by day. New refuse pits have been dug. 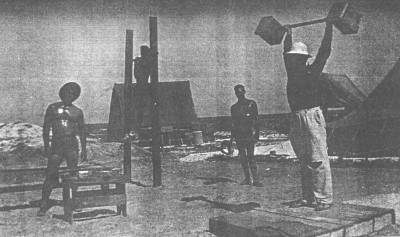 Collins got more lumber at the shipwreck and built a table for use in the kitchen. Aune likes the new stove better than the old one that burned oil. The path from the beach to the beacon is about 5 feet wide and is covered by four inches of coarse sand. We now have two roads into camp, one past the beacon and one direct from the beach, along the old guano tracks left by the guano diggers. April 22. When raising the flag at 5:35A.M., Collins, Toomey and Ahia sighted a white ship about 8,000 yards off the west coast. At about 6:30 A. M. the Itasca was off the landing. The official party and several of the crew came ashore. They inspected the camp and seemed highly pleased. The landing boats made three trips and brought ashore additional water and supplies. Graf went on board to get a few needed items. The stay of the visitors was brief and by 9:00 A. M. the ship was under way, making a circuit of the island. Aune and Toomey spent the remainder of the day making shelves and arranging the new supplies. Mr. Griffin was very thoughtful in his selection of additional foods, and items which we had been thinking of were included. Fresh fruit and real crackers were novelties on our supper table. Coconuts from Samoa were planted around camp, each of us trying our luck at getting a tree started. This ended our fourth week on Jarvis. April 25. Following breakfast, Collins set out to do some more measuring and staking out of rock piles and ridges on his map. Ahia is also making a map of Jarvis. A supper of sweet potatoes, cabbage slaw, pea soup, wieners, crackers, jam and other nicknacks was highly enjoyed. April 26. A map-making routine seems to have developed among the group. Angles, degrees and dimensions re the topic of the day. Graf continues to collect shells. April 29. The first thing this morning a bos'n bird as found making its nest at the beacon, right where it is necessary to stand for reading the thermometer. The bird fussed some each time someone came near, but continued to hang around. It refused to eat bacon scraps. Finally, after e several hourly disturbances, the bird decided it would nest elsewhere and flew away. Food inventory was taken today. Collins is starting work on his fourth map of the island. He has also started digging just southwest of camp to determine the depth at which water can be struck. The water from Samoa was not considered as good to drink as that from Honolulu. April 30. Toomey, Collins and Aune had a close all with a shark while swimming at the landing place. Ahia and Graf caught about 50 aholehole fish and saved the largest for eating. In the afternoon Collins visited the shipwreck to get lumber for a sketching board. In the evening he picked his way through about two feet of solid rack in the water hole. He carries out a schedule of mapping each day and also spends about an hour working in the new water hole. May 3. While helping Aune get supper, Toomey spilled some hot cooking oil and burned his legs and feet. Through prompt treatment, although huge blisters formed, they were nearly healed in about three weeks. May 7. The airfield is completely staked out. May 8. A brick oven, started by Collins and Aune, as been improved with empty kerosene cans for either cooki-ng or baking. It adjoins the previous fireplace. May 9. Collins and Graf went to the shipwreck to collect insect and marine specimens. They brought back a black, yellow-edged eel, a small crab, lobster, jellyfish, worms, sponge and seaweed. May 10. Work on the new waterhole has been discon-tinued because of cave-in possibilities. A depth of nearly 12 feet was reached. It will be used for garbage. May 12. Collins plans building a cabin or house, using the fly tent, which was pitched on the beach, as a roof. He repaired a. chair which he had brought from the shipwreck. He made several trips and has a framework set up. May 17. Ahia caught a grayish, brown-speckled ee1, too large to be kept. Sharks are plentiful toward the N. E. end of the island, and rather bold and curious. May 18. Collins put the fly, from the beach, as the roof of his house. He carried gravel for the floor, and has the outside banked with a foot or two of rock. May 19. Another Sunday ends our eighth week on the island. Collins put a few finishing touches on his house and declares it complete after one week of work. There has bee more than the usual amount of rain the past few days. The moisture is giving the radishes a "boost. " Another dozen or so plants broke through the ground and look healthy. Coconut plants, 14 in all, retain a partial greenness. During the re-cent moderate rains it was noticed that the ground in the central section of Jarvis becomes marshy and boggy, but it dries quickly. In places it cracks and cakes. May 20. Ahia substituted for Aune as cook, starting with eggless hotcakes. Collins and Ahia moved into the new house. Toomey and Graf occupy the Headquarters tent vacated by them. May 21 was spent in routine exercising, swimming and reading. Toomey's foot nearly healed but it bothers him to walk on it. Several zinnia and lettuce seeds had sprouted as a result of last week's rain, and a few peanut plants are well above ground. May 24. Toomey welcomed back into routine activity. Collins, Toomey and Ahia fished at the landing and caught a good sized red snapper. May 28, Toomey and Graf caught a few lobsters right after breakfast. May 29, Ahia had good success baking in an improvised oven. He strives for variety and tries many new things. We relish his baked dishes. He and Aune worked together last evening on "peach cobbler." Supper, June 4-- pea soup, tomatoes, fried fish, boiled squid, navy beans, sauerkraut, called a "meal fit for a king." June 6. Collins started the day with a trip to the shipwreck in quest of a canvas to patch his cabin and keep the sun Out. Zinnia plants continue to grow. Aune transplanted some pickleweed (Sesuvium) to use as a hedge. The log records numerous collecting trips and catching fish. June 11 The Hawaiian boys observed King Kamehameha Day. June 15. The ltasca was sighted to the north and soon arrived off the landing. This ends the log as kept by Graf. It was continued by George West. Those in the first landing arty were W. T. Miller, H. A. Meyer, Commander Derby and his aide. Collins, Graf and Anne went aboard to return Hawaii. Henry Ahia and Dan Toomey elected to remain and were joined by George West and Frank Cockett. Mr. Albert Judd, Donald Mitchell, Mr. Meredith and the crew of the Itasca came ashore for a visit. Fresh supplies were landed; also 15 new drums of water. Unloading was completed by 1:30 P.M.; many of the visiting party had lunch on Jarvis. We had a serious talk with Lt. Meyer regarding our food supply, water and duties. By 4:15 P.M. all of the visitors were in the boats ready to go aboard the Itasca. The particular handshake of Mr. Judd and the tone of his words were so sincere and well meaning that they touched us all. We would all make good for Kamehameha (Schools) and all other Hawaiians. The ship left at 4:45 P. M. Henry [Ahia] then talked to us regarding the importance of our duties, and our situa-tion for the next three months. He and Dan gave us a few pointers about the weather instruments, how to read them and record the readings. At supper, on each side of the kitchen table sat Henry Ahia, Dan Toomey, Frank Cockett, and George West, residents supreme of Jarvis Island, U.S.A. In the midst of our supper we remembered that we had for-gotten to lower the flag, so we rushed out and did so in true American style. June 16. We spent all morning putting the cottage and tents in order. While taking an evening swim, Henry caught a shark, one of several close to shore. All this, the beautiful sunset, seeing "mice" running in all directions during supper, were experiences new to Frank and George. We have a little mascot, a baby frigate bird; this was its second day with us, and very much alive. Our supply of apples and oranges is beginning to spoil, so we are consuming them as fast as we can. June 17. Frank, Dan and Henry hauled up three drum of water. Frank and Dan caught aholehole fish for the little mascot. We made a close written account of all our rations and arranged the supplies. In the late afternoon we hauled up four more drums of water. The coconuts are doing well; even radishes and flowers are coming up slowly. We opened the Bishop Museum collecting box and arranged its contents for instant use. June 19. Pancakes were served for breakfast. Dan caught small fishes for the little frigate bird. He caught one, fish we didn't know and saved it as a specimen. Henry clipped the hair of George and Frank. A ukulele and books 3 of Hawaiian songs by Charles King and Johnny Noble were additions to our entertainment. The remaining four drums of water were hauled up. June 20 Dan made a portable lighting system. June 21. Visited the shipwreck. Frank and George were impressed. Caught 18 fish and a lobster. Raw fish and poi made up our noon meal. We had a short rainfall at dusk with heavy raindrops. Fried fish for dinner. We learned that hermit crabs feed on "mice. June 23, Sunday. Everyone seemed quiet and solemn all day, with devotions in the evening. Frank Cockett was startled by a large bird inside the beacon, which he thought at first was a bat. June 24. We made boxes into which various types if soil would be placed in which to plant seeds. 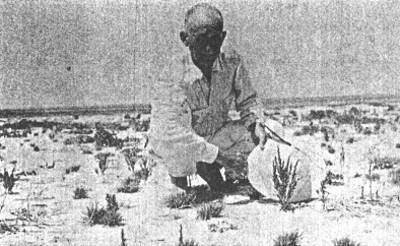 The soil was col1ected in barren land in the easternmost part of the island; also some from guano diggings and nearby mounds. There are only four packages of seeds: phlox, marigold, lettuce and radish. The weather instruments are not giving us logical readings. The anemometer was cleaned and oiled according to instructions. June 25. Bag coverings were made for our sand boxes. White beans, brought from Honolulu, were planted after a night's soaking. The coconuts were cultivated again. The weather instruments are now operating satisfactorily. Frank and Daniel caught a red snapper and made a delicious chowder. Our little frigate bird, which we named Sailor Boy, died early this morning. It was probably too young to be taken a way from its mother. June 26. At 2:45 this morning we had the heaviest rain since June 15. Two kites were made to learn how the birds on the island would react to them. One was tied to a pole at the shipwreck. Many birds flew around the kite but did not attack it. Dan flew his kite after lunch. Again the birds only showed their curiosity. We are taking daily physical exercise in the evenings in a miniature outdoor gym. The "mice" on the island are a menace to our gardens. June 27. We made a shell-hunting trip around the island. Shells were scarce and hard to find. We stopped at one place to watch the sharks swimming around in water so shallow that it amazed us. We watered the gardens in the evening. June 28. Frank and Dan went fishing. Henry inspected the landing field site. Several little mounds needed to be leveled and a few holes filled. The beans we planted on the 25th are beginning to sprout. July 29. We are learning to play the ukulele and also to fly kites. The phlox seeds which we planted are growing. June 30, Sunday. No church to go to, but we held our period of reverence. Wind and rain at 4:45 P. M. Several things had to be moved around to be protected. It poured at intervals all through the night. The white beans have sprouted more than an inch above the soil. July 1. New camp activities: Dan Toomey and Frank are the new cooks; Henry gathers firewood; George enters the day's events in the log, prepares menus, and helps Henry. A weekly check of rations was made. Ocean water, for washing, was stored in a container by George. Dan Toomey recharged batteries. A bad squall this morning from 10:26 to 10:29; a sudden gust of wind and a heavy down-pour. Henry and George spent the afternoon filling holes in the airfield. July 2. Frank and Dan caught three good fish, two of them strange to us. One is black and red like a kolo. They had an encounter with a large shark. Seeds were sprouting and look healthy. We ascertained the time of sun-rise and sunset from the World Almanac to check on our time. July 3. We are building a wooden bed to accommo-date more than two persons to use as a couch. Frank, Dan and George brought a broken door and pieces of lumber from the shipwreck. At nightfall we laid our mattresses on this and all four of us initiated it. We also discussed building a raft and enlarging the cottage. Our log shows that a drum of water lasted two weeks. Daily exercises at sunset. July 4th was observed by flying the flag, having bis-cuits for breakfast, and ending the day with chicken noodles July 5 Henry spent the morning shell hunting. During his trip he saw some turtles on the westernmost side of the island. Dan and Frank spent the morning fishing, catching 'o'o and uhu. George collected insects. July 6. Frank, Dan and Henry went in search of suitable lumber for a raft. Not having the necessary tools, they collected shells instead and again sighted turtles. Our farming project is beginning to look discouraging; the plants are drying out. July 8. We started building our raft; o feet square, of four logs with an empty drum at each corner. We will use it for fishing off the channel where it will be possible to catch larger fish without danger from sharks. July 9 Henry and George went to the shipwreck for more lumber. July 10. We started enlarging the cottage, begun by Frank and Henry, because of the kinds of lumber found, instead of finishing the raft. The walls facing the west were knocked down and the side walls extended 12 feet. 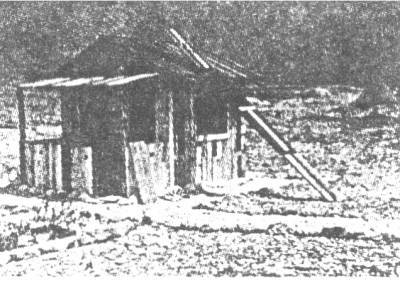 The roof was not completed because of lack of lumber. A gorgeous sunset, the sky almost completely orange color. The Sun's rays shone through cumulous clouds, with the half moon in a blue area overhead. July 11. The lumber business reached its peak: lumber was brought to camp all morning, with backs bent and shoulders burning. We put new pieces of tin on the table legs to keep the "mice" from climbing to the top. In the afternoon we finished the roof. July 12. Last night there was a heavy rainfall, heaviest about 12:10 A. M. Another severe rainstorm at 7:25 P. M. Heavy wind knocked down the kitchen tent, break-ing tent pegs. July 13, after drying and setting up the kitchen tent, we spent the day working on the cottage. We patched the roof with canvas and softened candles. July 14. There is now a lake in the center of the island caused by heavy rains. We saw a very bright meteor at suppertime. July 15. Seeing large fins, Frank and George drifted out on the raft to try to catch sharks. The fins turned out to be the curving ends of an enormous sting ray. It swam around the raft and caused a whirlpool. It had a black body and was shaped like an enormous bat. We decided that what we had thought to be dolphins were sting rays. The Hawaiians ca1l them hihi-manu. Fin tips may rise 5 feet above the water. July 16. At last we have moved into the cottage. It has a lanai on which we can enjoy eating meals. Now we are making cupboards, shelves, magazine stands, and a lighting system. We made a new cooking table and safe for dishes and silver. We can see the ocean while we eat. We knew by the World Almanac that the moon would be full. It rose over the eastern horizon as we cooked and dined. The tide was low tonight and the reef within sight was almost dry. July 17. Henry fixed a chair, made braces for the cooking table, and patched a hole in the canvas. Dan worked all day, cleaning the shells he had collected last night. Frank repaired his flashlight. George prepared menus, made corrections in the ration account, and tried to catch up with his diary. July 18. This evening it was nice and cool. The wet and dry thermometers read 77 and 73 degrees respectively, unusually low readings. The lowest wind velocity was at 3:00A.M., 3 miles. In the evening Frank and Dan went hunting on the reef. They found a number of shells and a large lobster, which they cooked. July 21. Today is our fifth Sunday on the island. We are all well and nothing serious has happened to us. None of us is homesick, but we do miss a lot of things. July 22. Our raft was finally completed by Dan and] Frank. Stray lumber from the shipwreck was used to make a platform. In its center a hole was left for fishing purposes. We plan to whitewash the cottage and the beacon. Henry got some lime from the airfield, mixed it and spent the day whitewashing the cottage. George carried bricks for the roadway around the camp. He and Henry spent much time washing and scraping the concrete off the bricks. July 23. Henry made a table on which to skin birds. He also made an experimental aquarium. He put in it some iholehole, with seaweeds and coral, but they all died. Yes-terday, when Henry went to get lime he found a partly dug grave, which looked as if it had been dug some years ago. Nearby were some human bones. In the evening Dan and Frank went torch fishing. They came back with 'o'o fishes, Lobsters and two stick fishes. They made their torches from 1½" inch pipe which they found at the shipwreck. July 24. Since the heavy rain of July 12, we have not had noticeable rain. The "mice" don't trouble us so much here as they did at the old place. There, during suppertime, they would run around in countless numbers. July 25. Ever since we started having pancakes for breakfast every morning a competition has been on. Everyo-ne has tried to claim the title of champion pancake eater. This morning we ate the best pancakes ever cooked on the inland, made by Dan. Dan and Frank went torching again after supper. They caught 26 lobsters and several fish, and had a further encounter with sharks. It rained disgustingly toward midnight, and our roof leaked so badly that we had to move our beds down to the tents for the rest of the night. July 26. Our cottage was in total disorder this morning due to the rain. The fish lasted us all day. They were the best eating fish we had ever had. We also cooked the lobster, some boiled, some made into soup. One of the fish is ailed po'o-pa'a; it is dotted all over the body with red, black and yellow. Another specimen, about the size of a human hand, has a flat body, protruding eyes, short legs and feelers. Its color is light red. July 27. Dan and Frank hiked halfway around the island. They noted seeing eels that ate crabs. One rose up like a rattlesnake ready to strike. At lunch time we saw several porpoises leaping out of the ocean, six or more abreast, and also following the leader. We had hot-cross puns with sausage inside for supper, made by Dan. A bug crawled into George's ear and made him feel very uncomfortable. We flushed the ear with coconut oil and warm water. July 28. It rained this morning at dawn and drizzled for quite a while. Held Sunday services. Fish at each meal. George's ear has not bothered him today, although he be-lieves that the bug is still inside. July 29. It rained again this morning. At 11:45 it poured. Henry went to the shipwreck for long poles to hold up the corners of the canvas. Dan repaired the roof. Frank and George came across a mound of bricks. July 30. We went out fishing for the first time from the raft, and stayed out for nearly five hours. July 31. We took a monthly inventory of ourselves Physical condition good. We live in a spacious cottage made from pieces of a shipwreck. Air and sunlight abundant ventilation perfect. Nights are cool. Everyone feels fine each morning. The dining room, parlor and bedroom are under the same roof. The dining room extends onto the lanai. During meals the whole expanse of the ocean can be seen. The kitchen is out of doors. The stove is a few feet away from the cooking table. The garbage cans, piles of firewood, etc. are handy and arranged systematically. We ran out of potatoes two weeks ago. Onions will be used up in two or three days. One can of ham has spoiled. We have enough poi for the month of August. Rice will last two weeks more We have half a bag of sugar and enough cream to last until the end of August. We have lots of corn, peas, and corned beef; sausages will be exhausted soon, and so will peaches and pineapples. Canned apples are good for weeks to come. Kerosene and water will last for months. There should be a ship on the horizon soon. A chop sui dinner will be given to the first to sight it. August 6. There was a change in the way dawn appeared this morning. The sea was calm, glassy. Out on the ocean white flashed- -fishes leaping and breaking the smooth surface. Booby birds skimmed the surface, catching, fish. Some would fly high, nose dive, scoop up the fish and fly away. The calmness of the sea made these antics easy to watch. Toward sunset the entire ocean within our view from the cottage was covered by porpoises, here and there. They seemed to be passing in review. We estimated seeing as many as 800. What is a night like on Jarvis? Despite its closeness to the equator, it is not warm or uncomfortable. It is cool and the breeze is soothing. At times two or three blankets dare required to keep warm. We watch the phases of the moon and clusters of stars. A word about the kind of weather reports we make. We record the kinds and amounts of clouds and visibility. We give readings of the wet and dry thermometers. The average velocity of the wind in miles per hour. We measure the amount and duration of rain. The most severe was the rain storm of July 12. At no time has there been thunder or lightning. Aug. 13. We measured the distance around Jarvis as 5.05 miles, and tried to figure how many yards the .05 represented. August 14. At 3:50 P.M. it was windy and the sea was choppy. Suddenly there was a cry from Dan Toomey, 'Hey, look at the ship out there!" It was about 2 miles off. All four of us ran out of the cottage and climbed the beacon. The ship appeared to be a black tramp freighter. It had a forema-st and an aftmast and a smoke stack in between. The build of the ship was rather peculiar. Nothing else was visible except a little structure behind the smokestack. There was no flag flying. They came so close that we thought they wou1d surely land, but instead it slowly drifted away. Its bo0w was pointed in the direction of Palmyra Island. It was tout of sight at 4:45 P. M.
Aug. 15. This evening, beginning at 6:06, occurred steady downpour of rain which lasted until 6:30. The roof now almost rain-proof. About 3/4ths of a clean galvanized garbage can was filled with rain water. Aug. 19. In the afternoon Dan speared four uhu, which we had for dinner. Our raft was washed ashore and quite a wreck. A bos'n bird laid an egg inside the beacon. This will give us an opportunity to see exactly how long it will take to hatch. Aug. 21. Henry and George repaired the raft and used it to go fishing. They caught nothing, not even a shark. George spent the afternoon writing about birds, and made trips into the field to verify his descriptions. Aug. 22. An enormous turtle was captured at 9:00 this morning. About 4:00 this afternoon two turtle tracks were seen on the beach leading up toward the interior. A little later a turtle was seen close to shore, but soon dis-appeared. We visited the area at 9:00 P.M. and found a third fresh turtle trail. We found the turtle just above the beach crest on the west coast, and captured it. Henry and George also saw a strange bird near the shipwreck. It was about 6 inches long with a wing spread slightly less than a foot; wings and tail brown, with white around the neck, under the body and above the tail. Head and bill, which is an inch and a half long and curved down, are black. Aug. 23. Today was turtle day on Jarvis. Much difficulty was had in attempting to drive it home from where Henry and George captured it. It was stubborn; it wanted to go inland or back to the beach. At 11:30 it refused to move. It had taken 5 hours and a half to make it move 150 yards in our direction. At 12:00, Henry got a knife and a pan; killed it and brought back a pan full of meat. George and Henry went back for the shell. The turtle meat was good; some was, fried. At dinner we had turtle soup. Some of the meat was put out to dry. Dan spent the afternoon cleaning the shell. Sept. 1. At 7:30 A. M. a two-masted sailing vessel was sighted on the western horizon. Strong winds were blowing and the ship came swiftly to our shores. We knew by the way the vessel moved around, just outside the channel, that it was going to anchor. Some difficulty was had, but finally a rowboat dropped the anchor on the reef. The ship lay less than a quarter of a mile out. When the first landing party came ashore we learned that this ship was the Auxiliary Yacht Kinkajou of Hawaii, bringing another scien-tific party. Going aboard, we learned that this expedition was headed by Dr. Francis Dana Coman of Johns Hopkins University. We shook hands with Dr. Coman and the skipper, Constantine Funk, and looked over the ship. It had come from Baker and Howland, and brought all sorts of news. We learned that we were going to have a radio re-ceiver and transmitter on the island. We also learned that the Itasca was to leave Honolulu on September 9. We learned that we were popular people in the feature sections of our home newspapers. There was a pack of letters from home telling us all about the things that were happening. Who could imagine how thrilled we were to see these people with all the good news and good things they brought. Dr. Coman was very friendly and told us to write letters home which he would take. We helped with the loading and unloading of the supplies. Jarvis was a scene of activity. The skipper and crew were busily engaged in putting up the tents and radio poles, moving the provisions and supplies. Dr. Coman was being shown to various points on the island by Henry. He was in-terested in getting samples of guano. He seemed to have an inexhaustible knowledge of birds. He gave the common and scientific names of all the birds he saw. Dan and one member of the crew went out for lobsters. They were unable to find any, but they caught an enormous number of aholehole. George and Frank helped the crew. Dr. Coman and the Captain dined with us tonight. Down on the beach Dan, Frank and the crew were cleaning fish by the light of lanterns. The Doctor remarked that we treated him like a hotel did, and he liked the food. The crew also had supper with us and everybody seemed to like the fish and food. Two of the Coman party will remain on Jarvis: they are William Chadwick, the radio man, and Louis Suares, a Kamehameha Schools student. Their camp is situated on the beach crest, about 200 yards from our cottage, right alongside the graveyard. After supper, they all went aboard the Kinkajou, including Dan and George. Staying on Jarvis were Henry, Frank, and Louis Suares. Dan and George chatted with the crew and listened to the radio; they heard stations in New Zealand and on the Pacific coast. Sept. 2. Dr. Coman, some of the crew, the radio man, Dan and George came ashore at about 9:00 A. M. Dr. Coman had breakfast with us as did the others who came ashore. He said he never ate better pancakes. After breakfast, Henry escorted Dr. Coman, Chadwick and Suares to various places on the island. They collected guano samples, which Dr. Coman said was a mission of the party now stationed on Jarvis. Dan, Frank and George kept company with the crew who came ashore. The Kinkajou has a small crew: first mate, chief engineer, three sailors and a cook, in addition to the Captain. Later Mr. Chadwick went to work on the radio apparatus, and the rest went swimming. The departure, at 11:30, was hearty. Dr. Coman again expressed his appreciation for what he called hospitality. It took over an hour to get up the anchor and set the sails. The Kinkajou finally got under way at 12:12 P. M. and was out of sight by 2:15. It was going to Christmas Island where it expected to meet the Islander, which was bringing more fuel. In the afternoon Henry and George helped Mr. Chadwick, who was racing against time to get the radio apparatus hooked up for night traffic. He said he had some important schedules to meet. By dusk everything was completed Suares had supper with us. We practiced good neighborliness and took food to Chadwick. After supper we all gathered in the radio shack to hear whatever news there was. The schedules did not materialize, but we heard the Islander calling the Kinkajou. Also, Mr. Chadwick contacted KYG, Globe Wireless Co. at Kawaihapai, and KHK at Wahiawa. He re-layed two of Dr. Coman's messages. We checked our clocks by time signals from San Francisco Naval Radio, and found them 15 minutes behind. Sept. 3. For the first time since leaving the Itasca we have eggs to eat: fried eggs for breakfast and some in our pancake dough. Fresh fruits, butter and rice were also received. We gathered in the "radio shack" tonight, and Bill Chadwick sent messages to our folks at home through an amateur in Honolulu. He also sent an article for publication, written by Dr. Coman. The Itasca was contacted, but Bill was unable to reach Howland Island. During the two weeks which passed between the arrival of the Kinkajou and that of the Itasca on September 15, very interesting relationship developed between the personnel of the two camps. Henry Ahia spent many evenings in the "radio shack" with Bill Chadwick. Various messages ere transmitted to Honolulu and the Itasca. 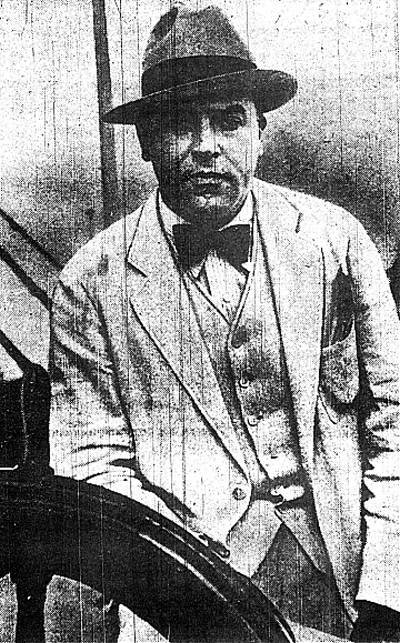 Louis Suares worked harmoniously with his schoolmates. They fished together, ate many meals together, included him in their work and leisure time activities. The Kinkajou had brought a number of old magazines, which added to their stock of read-ing material. Frank received word that arrangements for his entrance to the University of Hawaii had been completed, and now he is certain about returning to Honolulu; but Dan and Henry plan to remain on the island. Much time was spent improving the appearance of the camp. There was con-siderable heavy rain and drizzle on the 12th. Radio contact was made with Howland and arrangements were made for a radio program from Honolulu on the evening of Sept. 14, with greetings from relatives and friends. Sept. 15. The Itasca was sighted at 10:27 A. M. and it stopped about 500 yards off shore an hour later. The first landing party consisted of Mr. W. T. Miller, Captain H. A. Meyer, Commander Derby, Sgt. Austin Collins, and Theodore Kana. They were shown our new cottage by Henry Ahia, and commented on improvements since the last visit. Kenneth Bell and Jacob Haili will replace Frank Cockett and George West, George will go to San Jose State College. Henry and Dan will remain for another three months. Mr. Miller gave Henry and Dan permission to go aboard the Itasca for lunch, accompanied by Louis Suares and Bill Chadwick. Parties of the ship's crew came ashore and went immediately to the shipwreck to collect souvenirs. Others helped to unload supplies and water drums. Captain Meyer (promoted since his previous visit to Jarvis) talked with Henry Ahia regarding our food and water supply, health and other things of im-portance. Unloading of supplies and water was completed by 3:30 P. M., and all of the "Colonists" came ashore for a visit, to exchange news and admire the island. They returned to the Itasca at 4:00 P. M. The storing of our food supplies commenced immediately, and it was all safe within the shelter of the ration tent before sundown. Sept. 17. Jacob and Kenneth made a trip to the shipwreck before breakfast. Much of the day was spent checking the inventory list. Henry and Kenneth went spear fishing with Bill Chadwick. The large mullet they caught had worms in its flesh and was unfit to eat. Henry and Dan received a radio message from Honolulu that their parents and friends would speak with them on Saturday at 5:00 P.M. via radio-phone, made possible by Kenneth Kum King, radio operator on Howland with the Coman Expedition. Sept. 18. A double layer of wax paper was laid on the board roof of the cottage, and a canvas tent fly was put over the paper to hold it down. The evening centered around new musical instruments--guitar, ukulele and harmonica, with singing. Sept. 19. Just before lunch, two large fish were noticed swimming around the bathing place. They were not sharks but were believed to be either 'o'io or 'a 'awa. Dan's surrounding net was used to capture them, but one broke through the net and got away. The other measured 3-1/2 feet long, 2 feet 4 inches in circumference, and weighed 60 pounds. Some we had for supper, and the rest was dried. Sept. 20. It was noted that Kenneth and Jacob seem to have adjusted themselves to their surroundings and are fitting into the routine of duty in excellent fashion. The combined members of both camps went spear fishing and caught a variety of fishes. In the evening Henry Ahia heard that Joseph Anakalea and Folinga Faufata were stationed on Howland, replacing William Toomey and William Anahu, who are returning to Kamehameha for their final year of high school. Sept. 21. At 5:00 P.M. Henry heard his two brothers, Sam and Charles, speak to him over the radiophone; and Dan heard his dad. They told of interesting happenings in Honolulu--football, boat racing, and family news. Sept. 22, j Sunday, a "day of rest." Dan, Kenneth and Louis visited the shipwreck to get lumber for surfboards. Sept. 23. Kenneth, Jacob and Henry worked on leveling the airfield area and began to construct a large T-shaped marker, 20 x 30 feet to be visible from the air. Sept. 25. Henry and Jacob constructed another marker on the extreme western side of the airfield. Sept. 26. Kenneth worked on his surfboard, 6-1/2 feet long, the first to be constructed on Jarvis. Dan Toomey worked all day on one 12 feet long. Louis Suares went to the shipwreck for more lumber for his. Sept. 27. Kenneth Bell caught a "quail" this morning and brought it back to the cottage. He intends to make a pet of it The bird is quite tame but shy of our presence. We named the bird "Oscar. Henry and Kenneth, with a little scoop net, went into the field to catch love birds for pets. They captured two: one all white, the other lavender in color. Sept. 28. Kenneth made a trip to the shipwreck be-breakfast. He intends to lengthen his surfboard from a 6 footer to nine feet. Dan and Kenneth worked on their surfboards in the morning and went surfing in the afternoon. Sept. 29, another Sunday. Surf riding in the afternoon. In the evening Henry visited the radio shack and heard a radio program between Honolulu and Howland. Hearing that Dan Toomey's dad wanted to speak to him, Henry raced to the cottage and got the other three. Don Mitchell, of the Kameha-meha faculty, and various schoolmates also spoke. The occasion was Dan's 21st birthday. 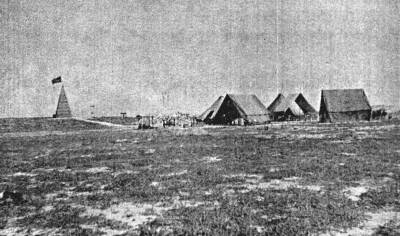 A view of the group's first camp.